Neelu believes in beautiful, simple and effective skincare, with a core philosophy of non-invasive skincare as the key to a glowing complexion. The long term care and treatment of skin is her passion and she believes in the five step approach to skincare that results in healthy and radiant skin irrespective of age, skin type or skin concern. Today’s facials are more than a luxury indulgence. Neelu’s advanced skin treatments use high concentrations of smart ingredients and effective machines. By repairing cells deep below the skin’s surface and restoring its natural equilibrium, her innovative techniques improve overall dermal health, promoting a naturally clearer, brighter, plumper appearance that lasts. OFFERING A NATURAL SOLUTION TO AGEING SKIN TO RENEW PLUMPNESS AND REDEFINE THE CONTOURS OF THE SKIN. Situated in the heart of Dublin, Neelu’s is a cutting-edge salon with a simple beauty philosophy. Neelu believes that when skincare begins with the goal of great skin health, everything else falls into place naturally. 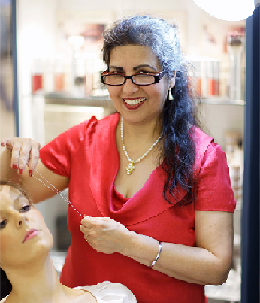 With over 30 year’s expertise Neelu is highly acknowledged as an authority in prestigious skincare. She uses this expertise and combines all of her experience to create well informed, bespoke treatments that yield long term results. She believes in tailoring each treatment to the clients’ specific needs, carefully selecting the right products and treatment to achieve the right purpose. Neelu is a regular contributor to RTE and TV3 and is featured in our national print media – Image, Irish Tatler, Irish Times on a regular basis.